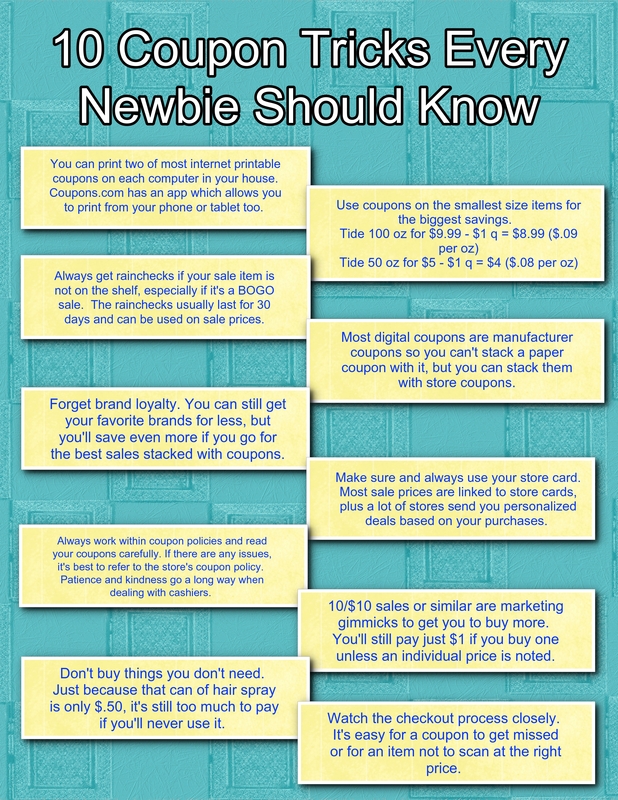 If you are new to couponing, welcome! I’m excited to help your family start saving money. Read through for all the basics, and you’ll be saving money in no time! Click here to figure out what all the coupon lingo and jargon means. Manufacturer coupons can be used at most grocery, drug, big box stores. Only one manufacturer coupon can be used per item. Coupons can be used just once. The store will keep it when you use it so they can redeem it for the actual value from the manufacturer. Ignore pictures! Read the words. A lot of companies will put pictures of their priciest items on the coupons. The wording will tell you specifics on size and if you can purchase any product within the brand. Use coupons on sale and clearance items to max your savings! Sunday newspapers are always the best source. There can be up to six inserts in the paper each week. Usually you’ll find around two, and the most come in the first Sunday of the month. For the DFW area, you can subscribe to the Dallas Morning News with a Sunday only edition for $2.99/wk or grab a 2-pack for $5/wk from most retailers. I have found that if you wait until Wednesday, they’ll put peelie coupons on the papers for up to $1 off so you can get the two pack for $4. Subscribe to Al Dia and Dallas Briefing for free. Both offer coupon inserts in their Saturday editions. They have most of the coupons you’ll see in the Sunday inserts, but might be slightly different. Hospitals, coffee shops, McDonalds, etc are all great places to find discarded inserts. Check out our post on where to find the best internet printable coupons!